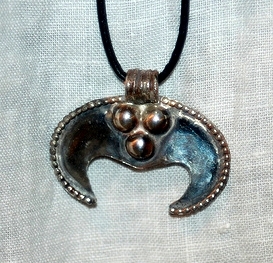 The lunnitsa is a pagan crescent shaped pendant worn from the 10th to 11th centuries (The State Hermitage Museum). 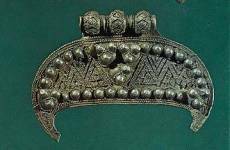 Samples of this piece have been commonly found throughout Russian and Ukrainian burial sites and were rarely found in Viking-Rus sites. Archeological finds in Village of Gnezdovo, Smolensk Region, Russia and Chernigov, Ukraine have yielded numerous examples of lunnitsi. Lunnitsa are exclusively found in the graves of women from all levels of society. The majority of the pieces have been made of silver, but gold ones have rarely been found. (The Odessa Museum of Numismatics). One unique mother of pearl lunnitsa was found in the Boldinogorsk necropolis in Chernigov (Shevchenko). The designs of the crescents ranged from a flat undecorated silhouette to pieces elaborately decorated with filigree, beading and granulation. (The State Hermitage Museum). The piece I produced is has design elements drawn from several pieces. It was made from a flat piece of sterling silver cut to shape, onto which were soldered beads; and a loop made from rings of silver wire. The pieces was cleaned and then polished with a fine grit to make it shiny.